With thanks to Murray Sulzberger and Philippe Regenstreif for information on the THV rounds, Michel Romieu for providing photographs of rounds in his collection, Thomas L. Nielsen for information on the Danish police and Slovakian bullet tests, and acknowledgements to the article 'The Monad Story' by Will Reuter and Erlen Meyer, published in the May 2003 edition of The Cartridge Researcher (the official bulletin of the European Cartridge Research Association). I have in my collection some odd-looking rounds of small arms ammunition, with reverse-ogive bullets fitted into conventional cases. Four of them are pistol rounds – a .32 ACP, 7.63mm Tokarev, 9mm Parabellum and .357 Magnum, but one is fitted into a 5.56 x 45 NATO case and another to the 7.62x51 NATO. The cartridges are shown below. I was curious to learn of their history and with the help of some friends have been able to piece it together. The story starts in France, with an attempt to produce pistol ammunition particularly intended for police requirements. The stated aim was to achieve good penetration, stopping power and accuracy while achieving a marked drop in recoil and in the "danger to surroundings outside the target"; i.e., a short range. The designer was a Mr Antoine; he was hired by SFM (Société Française de Munitions) who promptly secured the patents, produced the ammunition and began to market it. The design principle was to produce a very light bullet which could be launched at high velocity (hence the name THV = Très Haute Vitesse = very high speed). The bullets had a sharp point which in conjunction with the high velocity was intended to provide excellent barrier penetration. However, the sudden widening of the bullet behind the point was designed to generate a wide wound channel, and the light weight meant that it would quickly lose velocity, both in the target and (should it miss) in the open air. It was therefore only suitable for short-range use, and SFM only produced pistol rounds. As well as the three pistol loadings in my collection it was also made in .38 Special and .45 ACP. The cartridge cases are headstamped 'THV SFM' with the calibre. The bullet material is not specified in the manufacturer's data sheet but appears to be copper. The bullet was made with a hollow base, reducing the weight still further. The bullets were made with two different shapes: the first type had a simple point, but this was found not to feed well in self-loading pistols. A second pattern was therefore developed, with a wider, blunt tip, for the auto pistol loadings. Both types are shown below. The Danish police also tested THV bullets in 7.65 Browning (.32 ACP) calibre to see if they would improve the effectiveness of their old Walther PP and PPK pistols while reducing the risk of over-penetration. 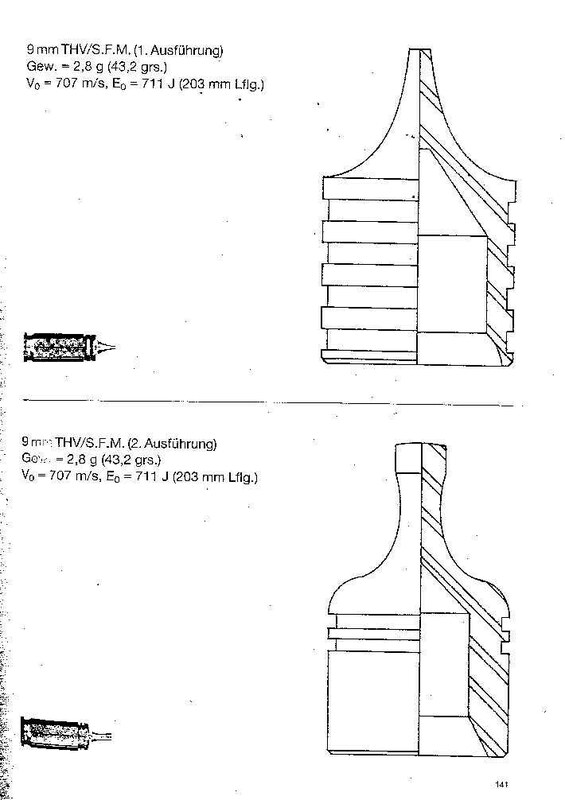 It was found that the THV bullet produced an entry wound which was twice the diameter of a full-jacket 7.65mm bullet, more closely resembling a 9mm. Only one of the THV bullets passed through the target when fired at the thorax or abdomen of pig carcasses. However, the Danes eventually decided to buy new pistols in 9x19 calibre. The initial problem with the THV ammunition was its high cost. It was then discovered that pressures were frequently too high, and that barrel wear was much faster than usual. What finally killed it off seems to have been a change in US legislation which prevented export to the USA, the target market. SFM subsequently closed down. In retrospect, it may have been decided that the penetration was insufficient for police purposes; after various failures of light, high-velocity hollow-point bullets to stop felons in the USA, deep penetration to reach vital organs is regarded as essential. That said, a Slovakian 9mm loading, stated to be a copy of the THV, penetrated over 330mm (13 inches) after passing through a NIJ II-A rated vest manufactured by Point Blank Body Armor, Inc. This was not the end of the story. Developments then switched to South Africa, and an explosives engineer called Andre van Dyk. In 1985 he established a Research and Development department at Pretoria Metal Pressings (PMP) with the aim of doing projects for the South African Special Forces. He began by developing a bullet capable of penetrating steel plate, glass and bullet-proof jackets while keeping the effective range short. Initial experiments were in 9mm Parabellum and the THV loading in this calibre was taken as the starting point. Tests showed that the blunt 'THV type 2' point flattened on impact, so a sharper point was used, together with a sharper shoulder. To retain good feeding, this was then fitted with a rounded plastic nose cap. Ironically, this meant that the bullet point had to be made blunt again, to retain the cap. At this stage the South African Police became interested and adopted the round; cartridge headstamps indicate that it has been in service since 1991. It is sometimes known as the 'monsap' cartridge (MONad + South African Police). Van Dyk went on to design a revised 9mm bullet intended to provide some expansion. The bullet retains the conical point but has a high ridge surrounding it. It was known as the 'Cobra' bullet, which was further developed into the 'Eliminator' or 'Sentry' bullets. These have been produced in a wide range of pistol calibres, including the 7.62x25 Tokarev. Bullets similar to the THV have also been made by Ram Products in 9mm, .38 and .45 calibres. 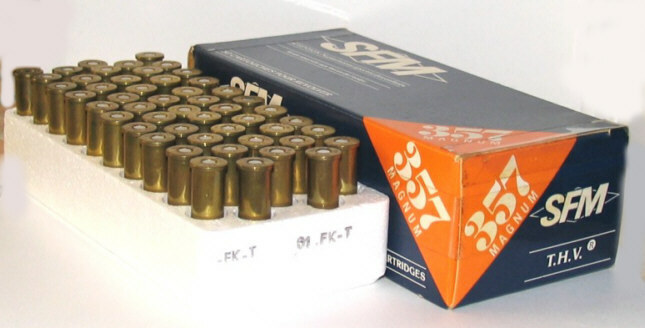 To return to the South African Special Forces, in the mid to late 1980s they issued a requirement for a similar short-range, high-penetrating loading in rifle ammunition. 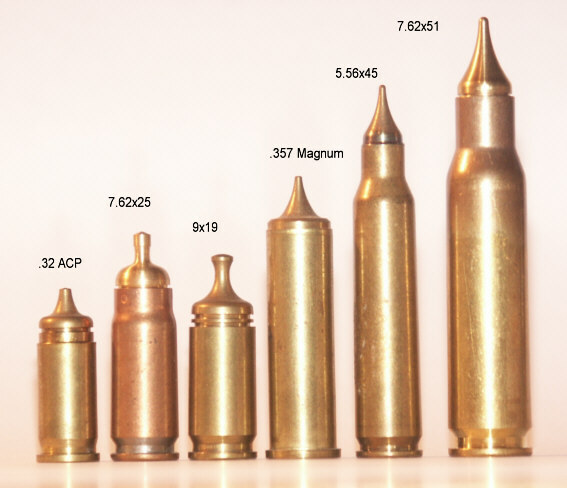 Monad bullets were accordingly developed, apparently without technical problems, in 7.62 x 51, 7.62 x 39 and 5.56 x 45. 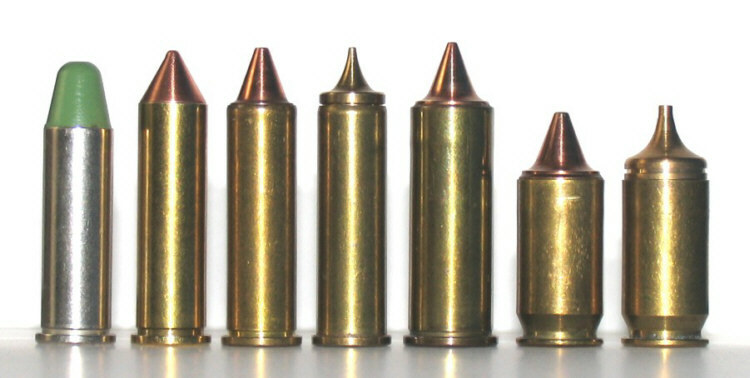 The 5.56mm bullets were made out of either copper or brass. No further information about their ballistics or use has emerged.